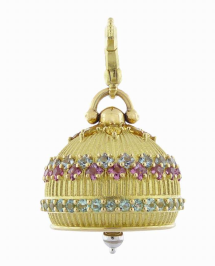 I've been eying Paul Morelli's temple-bell jewelry for a year or so; a bell charm set with yellow and green beryl and various colours of tourmaline is $5,260 at Ylang23. At 7/8 inch, in 18k gold, this "Meditation Bell" is a luxe bauble for well-heeled meditators, indeed. There's a considerable setting work here, but given that so much fabrication is done in parts of the world where labour is cheap (I don't know about Morelli, though), the stones (not costly gems to start with) look a little pale in the photo, and this is for only the charm, not a chain, my overpriced-alarm is clanging. If cost were no object, I'd love to wear multiple Morelli bells on chains, as shown in his ads– but it is, so let's keep looking. 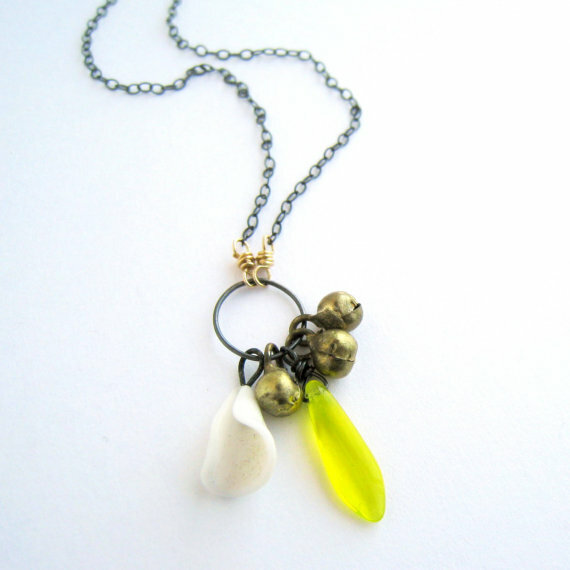 It's neither gold nor precious, but Etsy's chickrocks made a piece with brass bells, a white lily flower and a yellow glass drop that looks fresh and joyful, for $35. 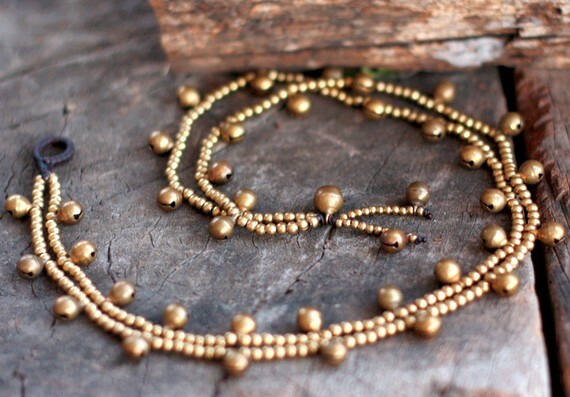 Just the thing to wear with pearls, a favourite chain or on its own. Another Etsy piece that I would have bought on the spot were it not for the 16 inch length, too short for me. 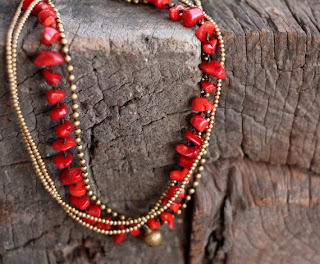 Coral beads strung on brown waxed linen, smaller brass beads, and yes, the bell! Just $22 from brasslady. 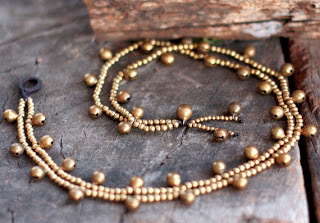 She also offers a brass necklace with many 6mm bells, again 16 inches, for $13, less than a buck a bell. Her designs are pretty; I'm going to convo her to request more length. For those with silver allergies or a fine jewelry jones, Alex Woo makes a truly elegant Thai bell, set with diamonds and garnet beads, nearly twice the height of Morelli's (1 1/3 inches); price ($1,978) includes a fine 20" 14k gold chain. The site specifies that "all work is done in the US" for her pieces. The bell is also available in white gold with topaz. Adding an element like a bell updates and revives your collection, whether you spend $22 or $2,000. If you want the bell silent, slide a bit of wool into the bell's top to invisibly reduce the clapper's mobility. Or let it ring, warning songbirds that you are sneaking up. These are so fun and unique! I love the sound of teeny bells. I'm going to see Chickrocks right now - the brass bells with white flower necklace, and the brass 16-inch necklace are just lovely. Thanks for sharing. To this Indian, a lot of those bells scream ' overpriced'. I also cannot get over associating them with very traditional 'auntie' type jewelry....that's not referring to age, but to personal style. But of course, western people won't have those issues so wear them in good health! 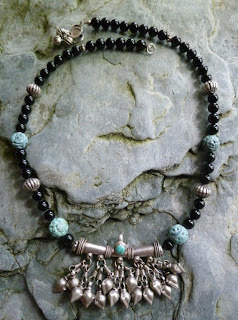 Beautiful pieces, and I love bells. I never think of shopping for jewelry on Etsy. Well, maybe that's because I never think of shopping for jewelry anywhere. Lately I've been falling in love with scarves -- have assembled a little collection I'm finishing by hand -- and it occurred to me that they might provide a focus for selecting earrings. I'm going to have a look at Etsy. Love the coral Etsy piece--but I agree, it's too short for me, too. I have bells hung all around my house, which chime lightly during the day. hadn't thought about wearing one! 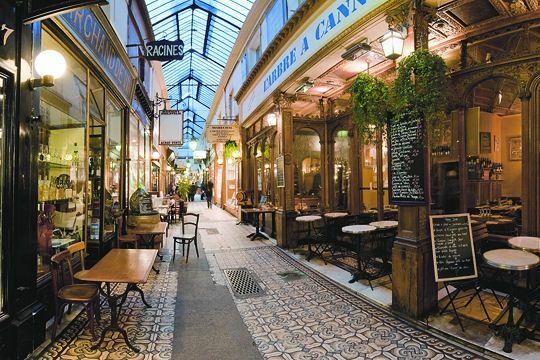 une femme: Interests me how many motifs are timeless yet have their "moment". Patti: Always pleased to intro new sources, that's the purpose of P des P.
AN: Another example of the West adopting something that has quite a different connotation in another part of the world. 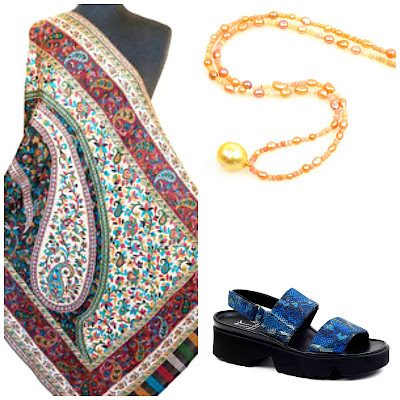 Susan Tiner: I too love scarves but as the temps climb way up, prefer a fine necklace and tie scarves on a bag. 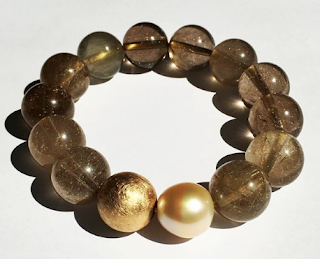 Pearl: Many Etsy (and other) artisans will make a piece in the length you request. Silver G.: I do not accept comments that link to commercial sites. Joanne Teichman: Thanks for that valuable information! I think I'd startle myself, if I rang. Even bangles now impinge. I wore a long necklace with a chime pendant when I was pregnant with my first. I thought maybe she could hear it. I just tried to Google for an image, and the first result was a page for 'maternity chime necklace' so I see others have had the same idea. What a sweet idea to wear a necklace with a bell that an unborn child could hear. All these necklaces are lovely. I had a little silver Indian bell necklace in HS -- it was Indian, and acquired during my "boho not-chic" phase. I think I may still have it tucked away somewhere. Probably black with tarnish! My best friend wore an Indian brass bell on a heavy chain in high school, circa 1971...I can still remember the sound it made! Would love to wear one myself now...! Rubi: An easy fix for that tarnish and a fun piece to mix in. emma: I can see how a bell could be one's "personal signature" accessory. I think the bells are lovely, and some of the pieces you chose look fun and interesting. I don't think I could manage to bear to hear myself jingling along all day however.